SpaceX’s crewed version of the Dragon spacecraft could carry people into space by the middle of 2016 and return them to Earth with pinpoint landings under rocket power, the company’s CEO said Thursday night. 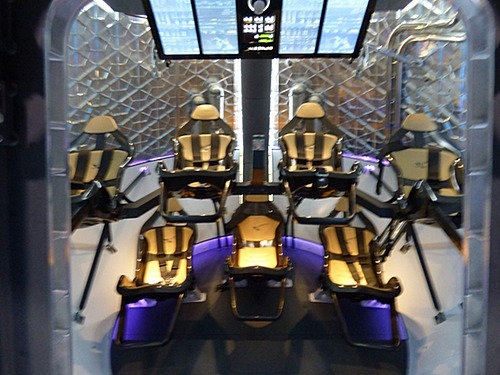 The Dragon V2 will be able to carry up to seven people for several days (although conditions inside the capsule may be a little cramped if there are seven people in there for an extended period.) 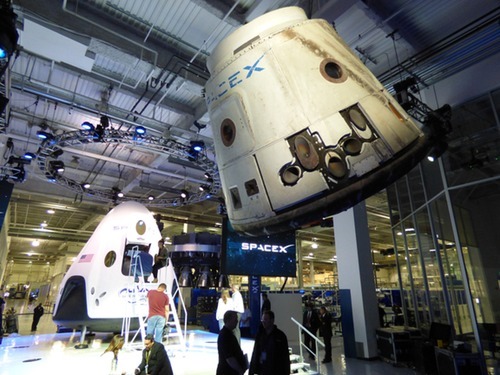 Unlike the current Dragon, which is grappled by the International Space Station’s robotic arm and berthed to a docking port, Dragon V2 wil be able to dock on its own to the ISS or another orbital facility. Although not discussed by Musk, the Dragon’s trunk is covered with solar panels to provide power in lieu of deployable solar panels. The capsule’s shape is also a little more tapered than the current, blunter Dragon, with recesses on the sides to accommodate its SuperDraco thrusters. Those SuperDraco thrusters are, in Musk’s opinion, the biggest change between the two Dragon versions. Those thrusters, which produce 16,000 pounds-force (71,000 newtons) of thrust, serve as both the launch escape system should the capsule need to get away from a the launch vehicle during ascent, and to perform a propulsive landing. The engines are spaced around the base of the Dragon in pairs, so that if one fails the other in that pair can take over. The dragon is also equipped with parachutes as a backup. The challenges in developing SuperDraco led SpaceX to use 3-D metal printing to manufacture the engine. “It’s a very complex engine, and it was very difficult to form all the cooling channels, the injector head, and the throttling mechanism,” he said. “Being able to print very high strength advanced alloys, I think, was crucial to being able to create the SuperDraco engine as it is.” Musk described SuperDraco as the first “fully [3-D] printed” rocket engine. SpaceX is preparing for a pair of abort tests that are some of the last milestones in its current Commercial Crew Integrated Capability (CCiCap) award from NASA. 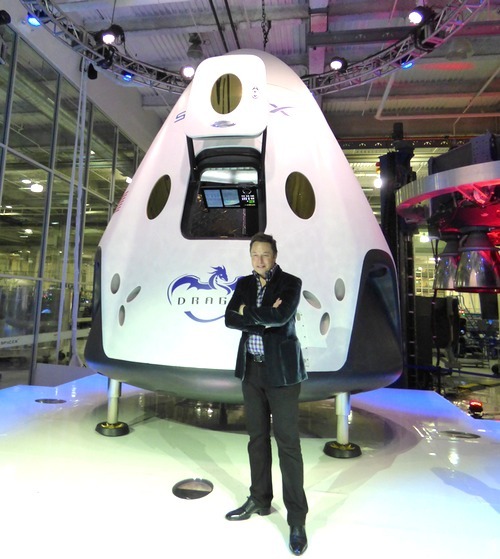 If those go well, along with other development, Musk said an orbital flight test of an uncrewed Dragon V2 spacecraft could take place as soon as late next year, with a crewed flight to follow in 2016. Development of Dragon, both the V1 and V2 versions, has been funded primarily by a series of NASA commercial cargo and crew awards, he said, estimating NASA’s contributions at about 70-80 percent of the total cost of $400–500 million to date, with a similar amount needed to get Dragon V2 to first flight. Musk indicated, though, that SpaceX would continue to work on Dragon V2 (presumably at a slower pace) even if it does not win a Commercial Crew Transportation Capability (CCtCap) contract later this year. “We’ll do our best to continue the development and still make it happen,” he said. I presume that in case of a launch abort, you need both SuperDraco *AND* the parachute, since fuel is consumed for getting the capsule out of trouble….. Yes I’d say that’s the idea. But if you have a nominal mission, the the fuel’s available for a powered landing and the parachutes stay packed. Maybe not. You’re not going at orbital speed or falling from orbital altitude so you may not need all the power SuperDraco has to get free and land. With 128,000 lbs of thrust (2 x 4 x 16,000) getting free and landing would seem to be feasible on propulsive thrust alone.